I am attempting to use the save and continue feature as I have a form below that requires one user in one location to fill out information and the rest of the form to be completed by another user at a different location. I don't know if I'm going about this the right way, but when opening the link on the second machine, the form is blank. Could you offer any advice on how I may be able to achieve this? You can achieve this using the session email method to continue forms later. You can test the demo form http://form.jotform.co/form/32927314628862 also. Thank you for your reply. That is the process that I am using, but when I open the link on a different machine or after clearing my browsing data I get a blank form. Here is the form I am using which to get the user data and send the emails with the links, then sends the user to the second form to complete. I did just edit it to add the "edit link" info to the bottom of the email since I saw that in another thread with the same question that I hadn't found earlier. The method mentioned does work if I am on the same machine and haven't cleared out the history. The edit link allows a submissions to be edited multiple times and does not lock. Using the Save and Continue later option will lock the data after submissions since the session on the server is cleared on submission and it wont be possible to edit it unless you provide the edit link. Ok, thank you very much for the information. Is there anything that sort of lives in between the two. Where something can be saved and filled out by a different person on a different machine and be locked when completed? When using the save & continue later option a temporary session is saved on JotForm servers, this makes it possible to continue filling the form on a different machine. If a different person fills the form they will be require to access it via the session link generated from the first form as described in the guide (Save forms & continue later) and not go to the second form's URL directly. This session is cleared from our server when the user submits the form so you can use this approach to emulate the submission lock. Kindly let us know if you need additional information or clarification regarding this. Strange, I couldn't get the save and continue later to work like that yesterday. If I cleared my browsing data or tried on another machine, everything that I had submitted was gone. I will try again today. That would definitely solve my issue. Is the length of time it stays on the servers defined by the "Time To Live" setting? Here is a link I generated with it when you load it to you browser it should prepopulate with data I have entered earlier. Ideally the recommend ed time the sessions is stored is 30 days, so the user can access the information within this time period. I just tried filling out the form again, then clearing my browsing data and upon reopening the link the form is missing everything I entered. The link you sent worked perfectly, I saw the data you filled in. Could the problem be my use of a field that is not an email address? Actually you will need to use the email field to set up the sessions, since emails are unique and using normal text-field might result in conflicts since the chances of a similar record existing are high. Ok. I will test with that. One question that does create for me though is I'm looking to use this form for sales reps to input information and they will be using the form for multiple customers. I would think that this would wind up with having the URL for each form be the same form number with their email address on the end. Would that cause one form to overwrite the previous customers form? I was hoping to use the SO # to give each a unique field so the same form can be used by the same person with different customers. What I am looking to accomplish is below. -Sales rep makes sale to a customer and fills out certain information on the form. Leaving some information blank to be filled out at the time the installer is doing the work at the customers location. -Using the sent link (that has been copied into order notes for the installer), the installer can go to the form(using their own computer or mobile device) and fill out the remaining sections once the work is complete. The installer will then submit the form at which time the completed form should be locked and I will have it emailed to various addresses. -I need the form to stay unlocked until it is submitted by the technician. There are times when this may exceed 30 days due to customer requirements. I did not see where to set this at. Thank you for all of the help. If the sessions is tied to a sales rep emails, we can append a uniqid number at the end of the session link for the emails as follows. Hers is sample edit link sessions I generated as a proof o concept the number at the end is appended form the unique id field. I also confirmed the duration period for the sessions and it is 6months, apologies for the incorrect time-span I had earlier told you. However, when I clicked the link, it actually opened the following URL. If I copy and paste the link into a browser it opens the correct page though. requires the existence of Page Break field on the 2nd form. and it doesn't have a Page Break field. The session can only be saved with the page break field. Try making a multi-page form by inserting page break field in between. Ah ok. So the info is only saved when someone clicks a "Next" button? I apologize for mis-understanding that part. I kept thinking it was the submit button as the pictures threw me off a bit. So I should do 1 form that just has multiple pages? Use the first form as the first page and the second form as the second page? But when I click on the link I get sent to the following URL. If I copy and past the URL that I got from the thank you page, it opens the correct page and auto fills the number field with the info defined in the URL. I got the same result when I emailed the form to my phone and tried from there. Let us know if the test form did not work for you as well and we will investigate furher. That definitely seems to work the way I am looking more or less. Not sure why mine opened the other form even with the link I received being different. I changed to using a different email address on my form and it did open the correct page, but now each time I try to get a different session, even if I enter the different URL's it opens the same session. It looks like the URL's, when clicked, are actually getting shortened to something that doesn't have all of the info in the URL. For example, after I copied the URL in and clicked a different link, the URL just looked like https://form.jotform.com/53276887560165/?session=tj.rowland@cccomm.co with none of the other info. The 2nd form also have conflict because it uses in-browser saving session. I have disabled it already. Test again from 1st form... submit and check if 2nd Form is properly saving session even when on different browser/computer. Let us know if still not resolve. Ahhhhhh. I knew I had to be doing something wrong. Thank you very much. I apologize for missing that. It definitely seems to work correctly. Thank you again. With the page breaks, does a save take place when either "Next" or "Back" is clicked or is it only when "Next" is clicked? In testing with using the next and back buttons. The 2nd form has a large number of required fields. These are required to be finished before the form is submitted, but with using those buttons, is there a way to make the "Next" button ignore checking that all required fields are completed? > With the page breaks, does a save take place when either "Next" or "Back" is clicked or is it only when "Next" is clicked? 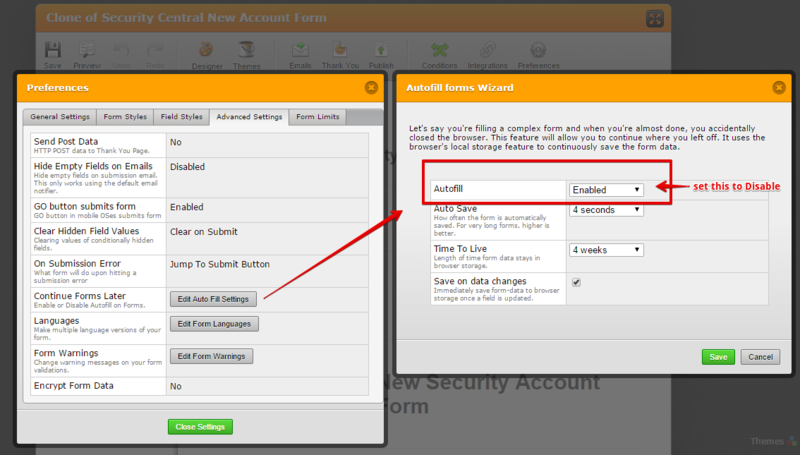 The entered data is saved whenever either the Next or the Back button is clicked. > is there a way to make the "Next" button ignore checking that all required fields are completed? I'm afraid not, the validation of required fields on the page is a required part of the process when Next button is clicked. In order to navigate to the next page, the current page has to be filled correctly - with all the required fields being filled. 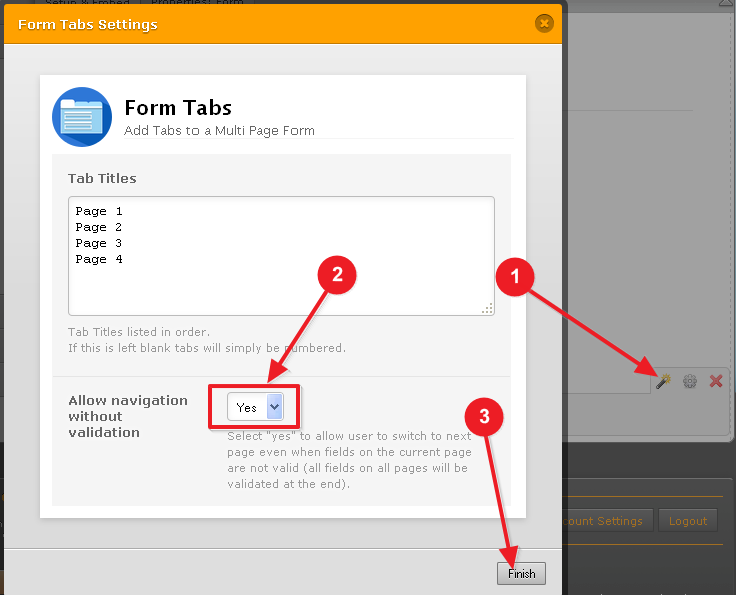 With that said, there is a possible workaround by using the Form Tabs widget, but it has drawbacks that the session is not saved when navigating through the tabs - it is saved only when clicking on the Next and Back buttons. What this means is that your sales reps can navigate through the pages by clicking on the tabs of the widget, where each tab represents a page of the form, but the sales reps absolutely must click on one of the form's Next or Back buttons before they finish in order to save the currently entered values on the form. Please let us know if you need further clarifications or assistance, and we will be happy to help. Thank you very much for the detailed information. I will test using the tabbed option as well. I thank you again for the wonderful support you guys offer. On behalf of my colleagues you are very much welcome. Do let us know if you run into any difficulties, we will gladly assist you.